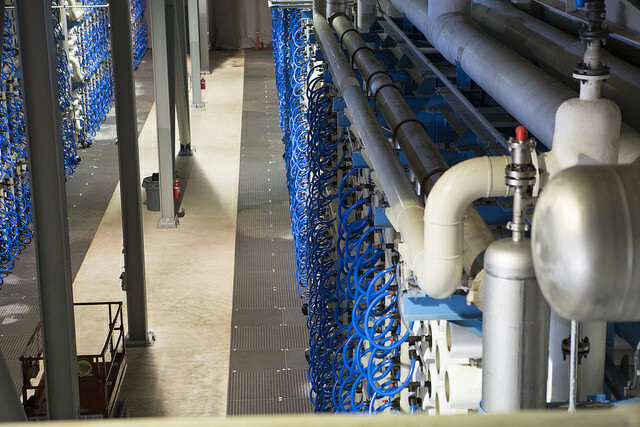 The Water Authority added desalinated seawater to its diversified water supply portfolio in December 2015 with the start of commercial operations at the nation’s largest seawater desalination plant. This new, drought-proof supply reduces the region’s dependence on water from the Colorado River and the Bay-Delta that is vulnerable to droughts, natural disasters and regulatory restrictions. Desalination uses reverse osmosis technology to remove water molecules from seawater. Water from the ocean is forced through tightly-wrapped, semipermeable membranes under very high pressure. The membranes allow the smaller water molecules to pass through, leaving salt and other impurities to be discharged from the facility. In November 2012, the Water Authority approved a 30-year Water Purchase Agreement with Poseidon Water for the purchase of up to 56,000 acre-feet of desalinated seawater per year. This is enough water to meet about 8 percent of the San Diego region’s projected water demand in 2020. Reverse osmosis is the heart of the Carlsbad plant. During this process, dissolved salt and other minerals are separated from the water, making it fit for consumption. This reverse osmosis building contains more than 2,000 pressure vessels housing more than 16,000 reverse osmosis membranes. Poseidon Water is a private, investor-owned company that develops water and wastewater infrastructure. Once the Water Purchase Agreement was approved, Poseidon built the Claude “Bud” Lewis Carlsbad Desalination Plant, which began commercial operations in December 2015. Poseidon also built a 10-mile conveyance pipeline to deliver desalinated seawater to the Water Authority’s aqueduct system. The 30-year Water Purchase Agreement assigns appropriate risks to the private sector while keeping costs for water rate payers as low as possible. The agreement transfers to Poseidon and its investors the risks associated with design, construction and operation of the desalination plant. It also transfers risks associated with the design and construction of the pipeline to deliver the desalinated water to the Water Authority’s Second Aqueduct in San Marcos. The Water Authority purchases water from the plant at pre-defined prices. If the water does not meet quality requirements specified in the agreement, the Water Authority does not pay. The agreement also specifies that the Water Authority has the right to ensure that the plant is operated and maintained in a safe, efficient manner consistent with industry standards. At the end of the agreement’s 30-year term, the Water Authority may purchase the plant for $1. The Water Authority enhanced its regional water delivery and treatment system to integrate desalinated seawater. The new conveyance pipeline connects to the Water Authority’s Second Aqueduct in San Marcos. An existing pipeline has been upgraded with a new steel liner to withstand pressurized flows north from San Marcos to the Water Authority’s Twin Oaks Valley Water Treatment Plant. Improvements at the treatment plant allow desalinated water to be stored and blended with imported water that has been treated at the plant for delivery throughout the region. Water from the Carlsbad plant is more expensive than the region’s traditional imported water sources, but it has the significant advantages of being drought-proof and locally controlled. The plant also is south of the major Southern California fault lines, providing added water supply security in case an earthquake severs imported water supply lines. Desalinated water from the plant will cost typical homeowners about $5 per month, at the low end of projections when the project was launched in late 2012. The costs are already factored into the Water Authority’s 2016 rates. Based on current electricity cost estimates, the Water Purchase Agreement sets the price of water from the Carlsbad Desalination Plant at $2,131 to $2,367 per acre-foot in 2016, depending on how much is purchased annually. The first 48,000 acre-feet of water purchased each year will pay for the fixed costs of the project and the variable costs of water production. The Water Authority has the option to purchase an additional 8,000 acre-feet per year at a lower rate that reflects only the variable costs of incremental water production. For more information on the Water Furnishing Revenue Bonds, Series 2012 (San Diego County Water Authority Desalination Project Pipeline) (Series 2012 Pipeline Bonds), including CUSIPs and the Limited Offering Memorandum, please click here. 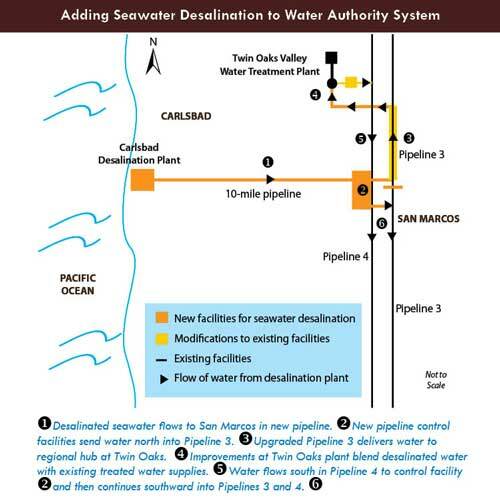 A potential Camp Pendleton Desalination Project is no longer under consideration by the Water Authority as a potential future water supply.